During the coldest, darkest time of year, it helps to have something fun to look forward to — and encourage us to leave the house. At Hubbard Inn, they’re offering up just the ticket with its new winter music series running all season long. On the heels of a new winter menu debut, the “Live at the Lounge” series is a free weekly music program taking place in the first floor Sun Parlor. Running every Thursday from 9:00 p.m. until 11:00 p.m., Kelsey Quinn Mark will whisk guests back in time with her soulful lounge music. An esteemed and established singer, she’s toured with Atlantic Records and performed at the likes of Lollapalooza and Bonnaroo. Additionally, Hubbard Inn has a new late-night menu that pairs nicely with lounge tunes. These include bacon-wrapped dates, smoked bacon sliders, mushroom-asparagus flatbread and a seafood platter brimming with oysters, crab, poached shrimp, shucked clams and Maine lobster. Drinking and dining outdoors during winter in Chicago may sound like a death wish, but it’s entirely possible thanks to places like Celeste. 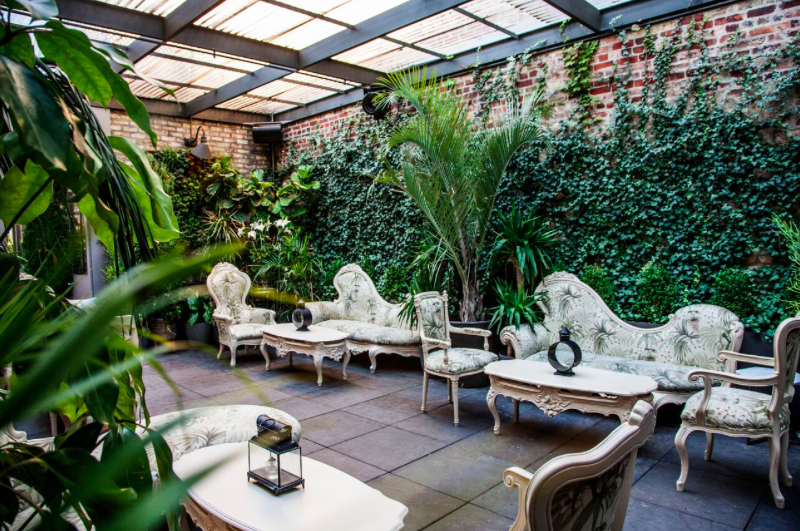 The multi-story, multi-tiered bar and restaurant encloses its gorgeous rooftop garden terrace during the winter months, providing an ample dose of sunshine and vitamin D without freezing patrons to death. The quasi-tropical space is filled to the brim with lush green plants, making the bar feel warm and refreshing no matter the forecast outside. The rooftop is also open past midnight, a rarity in the city when it comes to rooftop lounges. Revival Food Hall is starting off the new year on a new note, rotating in a new lineup of pop-up vendors for the stall that formerly contained Graze Kitchenette. For the record, Graze has partnered with fellow vendor Harvest Juicery to double up and offer both juices and bowls. Filling that vacant stall though, is bopNgrill, an offbeat burger-focused joint that got its start in Rogers Park. Known for their Korean influences, the casual eatery will operate through the end of March, at which point they’ll make room for a new Cuban sandwich concept from the folks behind Honey Butter Fried Chicken. For now, though, expect burgers and loaded kimchi fries at bopNgrill, which should offer something refreshingly different for Loop diners. Everyone loves a good eating contest for charity, especially when said eating involves tamales. The Delta, the buzzy Wicker Park newcomer rooted in Mississippi Delta-style red hot tamales, is hosting a tamale-eating contest on January 8 to benefit major league baseball star Curtis Granderson’s charity, Grand Kids Foundation. The event starts at 6:00 p.m., to be emceed by Granderson himself. The contest will feature 20 competitors, and those looking to vie for top prize can enter here. The $20 entry fee, along with money earned from sales of Cutwater Spirits, will go directly to the charity. Each of the four rounds will provide five minutes for competitors to eat as many tamales as they can, with the winner of each round going on to compete in the finals when they’ll have 61 seconds — a nod to U.S. Route 61 that spans the Mississippi Delta region. Each of the heat winners will earn a gift certificate, while the grand champion also gets a trophy.